Oct. 5 is the feast day of Blessed Francis Xavier Seelos, C.Ss.R., and a special Mass in his honor will be celebrated Oct. 6, 2013, in New Orleans, the city where he died. Get details about the Mass here. How much do you know about this 19th-century blessed, who worked hand in hand with fellow Redemptorist St. John Neumann? 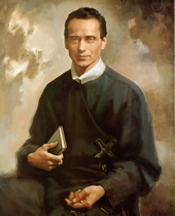 11 intriguing facts about Blessed Francis Xavier Seelos, C.Ss.R. He was born in Bavaria on Jan. 11, 1819, and baptized the same day. He had 11 siblings, three of whom died in early childhood. Two of his siblings also pursued religious vocations. He knew he wanted to be a priest from the time he was a boy. As a child, he pointed to a picture of his namesake, St. Francis Xavier, and told his mother, "I’m going to be another St. Francis." He began his theological studies in Germany, but after meeting the Redemptorists, he decided to enter the congregation with the intention of ministering to German-speaking immigrants in the United States. He was ordained a priest in 1844. He and St. John Neumann worked together at St. Philomena Parish in Pittsburgh. At that time St. John Neumann was pastor and also superior of the Redemptorists. Blessed Seelos later assumed both roles. Blessed Seelos lived a simple life and was known as "the cheerful ascetic." He was much sought after because of his kindness and excellence as a confessor. Blessed Seelos turned down the opportunity to become the bishop of Pittsburgh in 1860. He chose instead to preach missions in English and German in 10 states. In 1866 he became pastor of St. Mary’s Assumption Parish in New Orleans, during one of the city’s yellow fever epidemics. He tirelessly visited and cared for the sick and soon contracted the disease. He died on Oct. 4, 1867, at age 48. He was beatified by Blessed John Paul II on April 9, 2000. You can learn much more about Blessed Seelos at www.seelos.org.